Two big elections shook the United Nations in 2017: one of a new US president with a platform that leans sharply away from multilateralism, and the other a new UN secretary-general with a mind for reform. Secretary-General António Guterres has urged the UN to become “stronger in prevention, more agile in mediation, and more effective and cost-effective in peacekeeping operations,” while the new US administration has demanded budget cuts and issued threats. Just across the street from the UN, the International Peace Institute published a number of notable reports on the UN in 2017 (in addition to publishing the Global Observatory). In line with the call of the secretary-general, the top reports published by IPI last year provide insights into how the international community can best respond to some of the most pressing challenges to global peace and security by investing in conflict prevention, supporting mediation, and sustaining peace. Since the release of the report by the High-Level Independent Panel on Peace Operations (HIPPO) in 2015, implementation of the panel’s recommendations has been slow. To address this implementation lag, IPI researchers examined the secretary-general’s new reform agenda to determine whether it would help or hinder realization of the key strategic shifts called for by the HIPPO—recognizing the primacy of politics, viewing peace operations as a continuum, strengthening partnerships, and focusing on the field and on people. The final report also argues that for reform to be successful, the focus must extend beyond short-term improvements, such as structural reorganization, to change that will take place over time, such as improvements in workplace culture. In an effort to address the widespread problem of sexual abuse and exploitation in UN peacekeeping operations, in March 2016 the UN Security Council adopted Resolution 2272. To provide insight into how its contents can be operationalized, IPI produced this policy report examining the resolution and the key debates and controversies that surround it. Identifying nine implementation requirements and proposing twenty-one recommendations, this paper urges the UN to ensure that investigations of and responses to allegations of sexual exploitation and abuse are more trauma sensitive and prioritize the needs of survivors. Sustaining Peace: What Does It Mean in Practice? 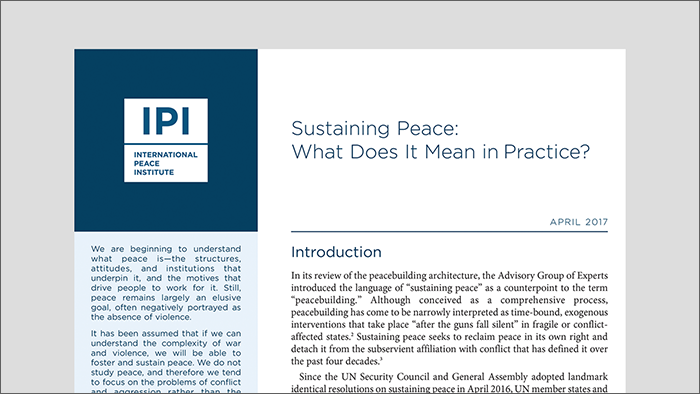 Following the adoption of dual resolutions on the UN’s peacebuilding architecture in 2016, IPI created a project aimed at building a shared understanding of what sustaining peace and prevention look like in practice at the national and international levels. To achieve this, IPI, with funding from ifa (Institut für Auslandsbeziehungen) and resources provided by the German Federal Foreign Office, held a series of high-level “conversations on sustaining peace.” One of the nine studies commissioned by IPI to help guide these conversations, this issue brief seeks to unpack the concept of sustaining peace, describing it as a paradigm shift that redefines how we think about peace and conflict. As part of its Lessons from Mediation series, IPI embarked on a research project to examine the events that put an end to one of the longest-running armed conflicts in the Western hemisphere – the war between the government of Colombia and the Fuerzas Armadas Revolucionarias de Colombia–Ejército del Pueblo (FARC-EP). Drawing on extensive on-the-ground research and a deep understanding of the Colombian context, this policy paper provides a comprehensive analysis of the mediation process and identifies several factors that were central to the signing of the peace accord and that may create challenges during its implementation. To coincide with the end of the Bamako Agreement’s two-year interim period, IPI launched this policy paper, which examines the difficulties of implementing the peace agreement. By placing current events in Mali in the context of past peace processes in the country and the 2014–2015 Algeria-led mediation process, the report explores six issues that have created challenges during implementation and goes on to identify a number of lessons for UN engagement in peace processes more broadly.